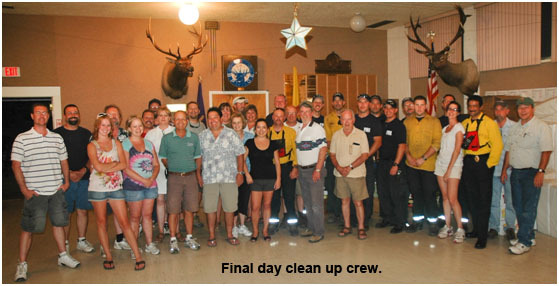 On behalf of the Los Alamos Elk’s Lodge BPOE 2083 and its members, we would like to thank all of those who participated in serving and protecting this great community during the Las Conchas Fire. We cannot express our appreciation enough. Thank You! Our thoughts and prayers are with our neighbors that have lost their homes, possessions, and livelihood as a result of the fire. We hope that some semblance of normalcy will return to your lives soon. As we did during the Cerro Grande Fire, it was an honor and a privilege to offer our Lodge as a community center, offering hot meals, coffee, water, snacks, toiletries and hospitality to those who worked so tirelessly to protect our community during the evacuation. It is amazing to look back and realize that we served approximately 14,000 meals over the course of the week. There are so many that volunteered their time, money or goods to ensure that we could serve the community. Thank you, Smith’s Grocery Store, Los Alamos CO-OP, LANL Foundation, Los Alamos National Bank, Merrick Company, Santa Fe Food Depot, Premier Distributing Co., De Colores Restaurant, Blue Window Bistro, Los Alamos VFW, Sysco, O Eating House, Hot Rocks Java, Walmart, Thai Café, and numerous others that supported our efforts. There are too many individual volunteers to list in this letter, however, please know that your efforts have not been overlooked. In closing, we met and came to know many of the emergency workers that spent a week or more in our community and we hope that our efforts were reflective of how much we appreciated your diligence and perseverance in battling the fire. Thank you, Wildland Firefighters, Helitack crews, National Guard, State Police, LAFD, LAPD, LAMC staff & LA County employees! It is a tough job that you have, and we hope you found a little comfort within our walls, even if it was for a short period of time. Click here for a YouTube Video. were not included on this list. Calles, Monica - VFW Ladies Aux Past Pres.